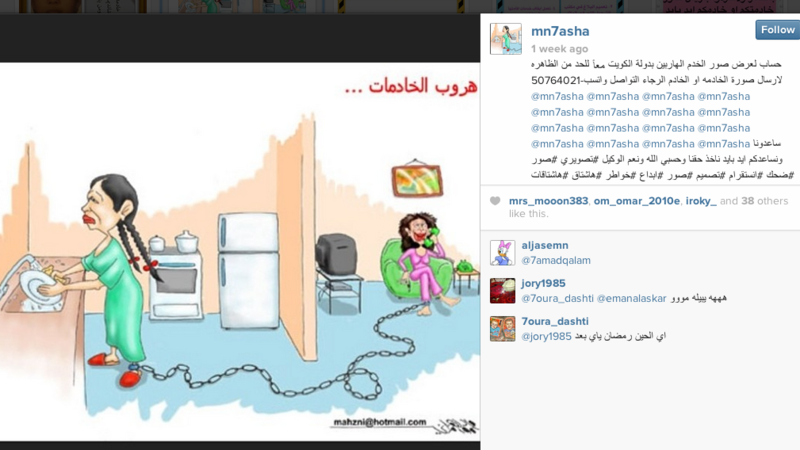 One week ago, an anonymous new Instagram account was launched to "post pictures of runaway maids in the state of Kuwait,” so that "together we can eliminate this phenomenon." The account’s profile photo is a caricature of absconding domestic workers and its bio lists a local phone number for followers to share pictures of runaway maids through Whatsapp. Within this week, the page has published 78 photos of absconded workers as well as ‘explanatory notes.’ In one of the first posts, the accountholder explained "this account was established because these runaways maids leave our houses and go work elsewhere. So we want to alarm others not to hire them." Another post encouraged followers to "take a picture of the housemaid if she is temporarily hired, just in case she runs away." In one the narrative posts, the account provides instructions for followers’ whose domestic workers escape. The post recommends "not to report the case to the recruitment office, but to the police station" and to "submit an urgent case to the court against the absconding maid asking to terminate her record and access" followed by a similar complaint to the migration directorate. The post concludes: "this way the maid cannot leave the country through her embassy or the detention center and the sponsor will not have to cover any traveling expenses." Another post requests for followers to "please send a picture of the maid's civil ID as some of the expats look alike." Several Kuwait-based Twitter users have criticized the account and requested people to report it for abuse. Comments on the photos are largely supportive of the account, colored by xenophobia reflective of popular narratives demonizing domestic workers as opportunistic interlopers. Similar accounts targeting domestic workers have been created especially following the crackdown on Ethiopian workers in Kuwait. Though limited in its reach, the account is sparking some discussion between citizens. The few critical commentaries do succeed in receiving responses from the account administrator; most of these critiques argue that domestic workers would not have escaped in the first place if they were treated well. Such perspectives were largely absent from public discourse just a few years ago, but recently civil organizing has helped produce a space for these critical voices. Yet, practices that involve ‘naming and shaming’ workers, like this account, are widely perceived as a necessary reaction to ‘illegal’ activity – a perception that is unfortunately sustained by Kuwaiti sponsorship laws, that do criminalize absconded domestic workers. Workers caught by authorities can be forcibly returned to sponsors or deported. Kuwait is also seeking to take legal action against embassies sheltering absconded workers. Yet, few other options are available to domestic workers subject to abusive or exploitative conditions that often amount to forced labor; domestic workers are heavily constrained in their ability to lodge a complaint against employers. They not only have virtually zero access to translators or attorneys, but under Kuwaiti law have minimal standing to sue unless the issue is related to unpaid wages. Most legal cases that succeed in penalizing the abusive sponsors involve only very severe abuse or death. Embassies are largely unwilling to interfere in employer-employee relationships, and even then do so only on humanitarian, not legal, grounds. This account epitomizes the ever-present reverse victimization narratives that frequent Gulf op-eds; abusive conditions that lend to absconding are recurrently obscured by paranoid, racist discourse that serve to justify employer’s nearly unchecked power over domestic workers. Maids are regularly portrayed as dangerous, crazy, greedy, and sinister – as though their actions are inherent characteristics of their ethnicity or class, rather than a result of their employment and living conditions. These narratives minimize the systematic conditions endured by workers, including physical, psychological, and sexual abuse, invasions of privacy, overwork, and underpayment. They maintain that maids collude with recruitment agencies or with each other to rip off employers, that it is employers who require more adequate legal protection of their rights; that it is employers who are somehow systematically exploited by the most marginalized, least protected individuals in the country. But these extreme misperceptions reflect precisely those undergirding the unjustifiable actions of the Kuwaiti government, which since 2013 has deported thousands of migrant workers under the auspice of a security campaign. Workers have been deported for minor traffic violations, for working without proper documentation, or for no reason at all. Many have been summarily deported without a court case, receiving no translation or legal aide. Few have the opportunity to contest their deportations, to hold responsible the sponsors that may have violated their rights and prompted them to abscond. Kuwait disproportionality criminalizes absconded workers, failing to investigate the causes of their leave, failing to hold equally accountable the actions of unscrupulous employers who exploit the sponsorship system in order to exploit migrant workers. Kuwait’s actions suggest that undocumented and absconded workers are not entitled to basic human rights, an unjust perception imbued into the citizenry and into this dangerous distortion of vigilantism.